This plate comes from a set that form a frieze about 54 meters in length, depicting an allegorical Triumphal Procession. 139 plates were planned for the scheme. This was one of three large-scale mural projects which together reflected Emperor Maximilian I's (1459-1519) status as Holy Roman Emperor and linked him symbolically with ancient Rome. The project was not finished by the time of Maximilian's death but the set was published later, in 1526. 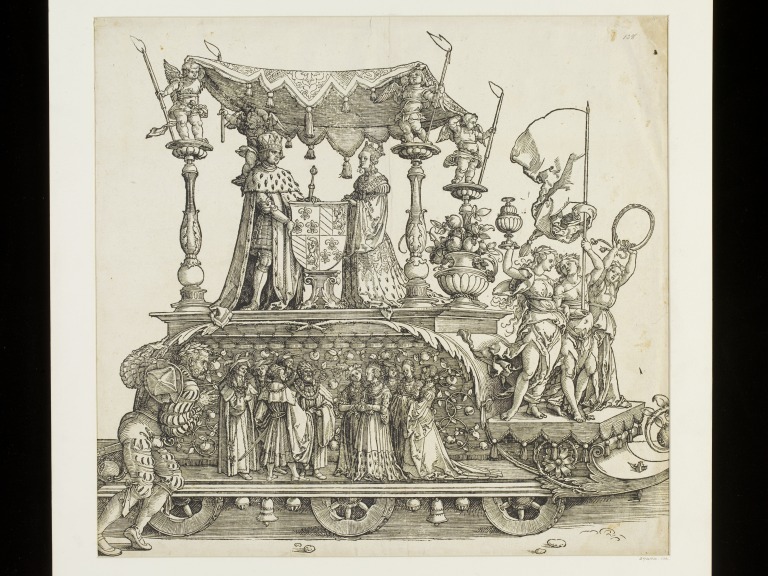 Hans Burgkmair designed much of the procession, begun in about 1512, with contributions from Albrecht Altdorfer, Hans Springinklee, Hans Beck and Hans Scheufelein. The designs were cut by Jost de Negker's large team of block-cutters. The two other mural projects include a large Triumphal Arch, about 12 feet high by 10 feet wide and made up of 192 blocks, and a Triumphal Carriage about 8 feet long made up of 8 blocks. These were designed by Albrecht Dürer, with assistance from Hans Springinklee, Wolf Traut and Albrecht Altdorfer. The procession was not intended for sale. The city of Nuremberg apologised to the Emperor for some impressions from the blocks having been sold. The friezes were intended as gifts for wall display. According to surviving correspondence, Maximilian wanted the procession to 'grace the walls of council chambers and great halls of the empire, proclaiming for posterity the noble aims of their erstwhile ruler'. One plate in square format showing part of a continuous frieze of approximately 54 meters in length and 38 cm high, consisting of a triumphal procession, roughly in this sequence; a herald riding a griffin, horses pulling a large tablet (blank) intended to take the title, standard bearers, drummers, flaconers and hunters, court officials, carts pulled by various animals carrying musicians and entertainers, soldiers, jousters, Austrian banners carried by soldiers on horseback, Emperor's wedding, wartime triumphs represented by carriages illustrating lands or wars, King Phillip's wedding, funerary statues, prisoners of war, triumphs of war, imperial trumpeters and heralds, the King, Queen and Princes on horseback, foreign Ambassadors, soldiers, peoples of Calicut, and a baggage train. The V&A part numbers to this set do not correspond to the plate numbers as listed in Illustrated Bartsch, Vol 11, no. 81, page 166-177, with several plates being missing from the V&A set. Aside from missing plates, the numbering is in the correct sequence according to Bartsch until 29404:115. This plate is numbered 90 in the Bartsch sequence. 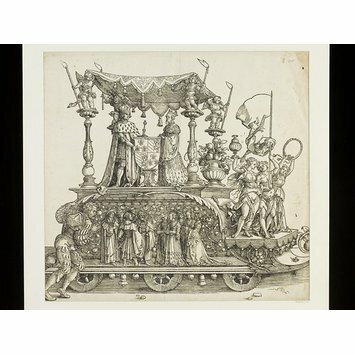 This plate comes from a set that form a frieze about 54 meters in length, depicting an allegorical Triumphal Procession. 139 plates are known for the scheme, begun in about 1512. This was one of three large-scale mural projects which together reflected Emperor Maximilian's status as Holy Roman Emperor and linked him symbolically with ancient Rome (the other two projects were a Triumphal Carriage by Albrecht Dürer; published 1522, and a Triumphal Arch. The project was not finished after the death of Maximilian. The scrolls and tablets without inscriptions. In the early edition these were printed in black. The first edition, 200 copies of the completed 137 blocks, was printed in 1526 on the order of Ferdinand, Archduke of Tyrol. A second edition was printed in 1777, consisting of 135 blocks. Hans Burgkmair contributed 67 plates and Albrecht Altdorfer 38. Other artists were Hans Springinklee (20 plates), Hans Beck (7 plates) and Hans Schäufelein (2 plates). The designs were cut by Jost de Negker's large team of block-cutters, work on the blocks carried out between 1516 and 1519. Blockcutters sometimes signed their name on the back of the blocks (most of which survive in Vienna), one of whom was Cornelius Liefrinck. The programme was worked out by Emperor Maximilian I and Johannes Stabius and written down by his secretary Marx Treitsaurwein. Altdorfer and his workshop produced a set of miniatures (62 now in Vienna Albertina), following the same instructions. The two other mural projects were designed by Albrecht Dürer with assistance from Hans Springinklee, Wolf Traut and Albrecht Altdorfer. They are a large Triumphal Arch in 192 blocks, almost 12 feet high and 10 feet wide when assembled, and a Triumphal Carriage in 8 large blocks, of 8 feet in length. Hans Burgkmair. 'Triumph of the Emperor Maximilian I'. Augsburg, 1512-19. Bartsch, Adam von. The illustrated Bartsch. New York : Abaris Books, 1978-, Vol. 11, no. 81, page 166-177. Bartsch, Adam von. Le peintre graveur. Leipzig, J. A. Barth, 1854-76. The triumphs of the Emperor Maximilian I. Manchester ; London : Published for the Holbein Society by A. Brothers, 1873. Talbot, Charles W. Prints and Drawings of the Danube School: an Exhibition of South German and Austrian Graphic Art of 1500 to 1560. New Haven, 1969. Dodgson, Campbell. Catalogue of Early German and Flemish Woodcuts Preserved in the Department of Prints and Drawings in the British Museum, London, Printed by Order of the Trustees of the British Museum, 1911, Vol. II. Most attributions to Altdorfer, except for the baggage train, worked out by a process of elimination, the other artists' contributions being listed in Hollstein and other publications. Baggage train (V&A numbers 29404:120-125) are attributed to Altdorfer in Talbot (see refs).